"I think we’ve seen just about all of the Hebrides islands, don’t you?" Bonnie said. It looks like we’re headed inland and I’m ready for that. It’s been cold." "We’ve got one more stop. I want to show you the Isle of Skye," Bruce said. "The Isle of Skye, like in the song and with Bonnie Prince Charlie and Flora McDonald and all that?" Bonnie smiled. "Yes, that’s the one. We’re going to a place called Dunvegan, which is on the west side of the island. Not far from there, on the moors, grows this flower called the yellow iris. It only blooms in summer and they say its nectar is to die for," Bruce told her. "Sounds good to me. Why don’t you fill me in on Dunvegan while we’re flying," Bonnie urged. "All right. Dunvegan has a castle. It’s the oldest inhabited castle in Scotland. It’s beautiful. It sits on a rocky peninsula, like an island. Parts of it date from the 9th century. The Macleod clan owns it and much of the island of Skye." "We’ve seen so many castles. What makes this one so unique?" Bonnie asked. "The fairy flag? What’s that?" "There’s a legend or two about it. One is that the fairies gave it to the family long ago and the other is that it dates from 400-700 A.D. and was brought here from Jerusalem. Now that’s an old flag," Bruce explained. "Wow. I can’t wait to see it," Bonnie said, excitedly. "Don’t hold your breath. They don’t fly it all the time, but we might be lucky." The butterflies soon found themselves surrounded by a thick mist. "Bruce, where are you?" Bonnie shouted, losing sight of him. "I’m over here. It’s certainly misty. We must be over Skye. They call it the ‘Misty Isle’ and now I can see why. Let’s land and see where we are," Bruce suggested. The two butterflies fluttered to the ground. "Look at those hills," Bonnie said. "You can’t see much of them but they look flat-topped." "Ah, those are Macleod’s Tables. There are all kinds of odd rock formations, black stone hills and tall, rugged mountains called the Cuillins, all on this island. Its quite beautiful." "We’ll never know unless this mist disappears," Bonnie sighed. "Oh look, Bruce. There’s a deer over there in the woods. It’s a magnificent creature. Look at its horns. He must be so proud of them," Bonnie said, amazed. It was bending over, sipping water from the stream. "I wonder if there are fish in that stream?" "You bet. It’s probably filled with salmon and I’m sure a few otters live under the banks and maybe a beaver or two," Bruce told her. "Would you like to go into town? It’s a wee village, but quite interesting." "Yes, I’d like that," Bonnie said. They flew towards Dunvegan and soon found themselves flying down the main street. "Is that a thatched cottage?" she asked. "It is, but they use it as a museum. Once there was a giant who lived here," Bruce said. "Bruce, there are no such things as giants," Bonnie scoffed. "Yes there was. His name was the Giant MacAskill and he was nearly 8 feet tall. He lived from 1825 to1863, right here in this area. I think there are a few things about him in the museum." "Did he go, ‘Fee Fi Fo Fum’?" Bonnie giggled. "No, he wasn’t that type of giant, like you find in a fairy tale. He was just a big man," Bruce said. "I like it here. It’s pretty, but my stomach is calling for those yellow irises. 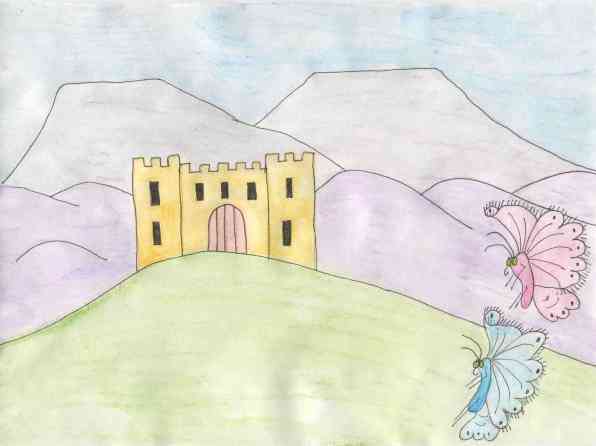 Let’s go to the castle and see if the fairy flag is out and then you can show me the moors," Bonnie pleaded. They fluttered away towards Dunvegan Castle. The fairy flag wasn’t out and they were both disappointed, but found peace and beauty there. The loch was still and the sunlight danced on the water. "This is beautiful and so quiet," Bonnie said. "I’m glad we stopped here, but as I said before, my tummy’s growling, Bruce." They headed for the peaty moorland. "Look at all the puddles of water and spongy ground," Bonnie noted. "Here we are," Bruce said, landing on a yellow iris. "Have a taste and tell me what you think." Bonnie stuck her proboscis into it. "Oh, that’s lovely. It’s very delicious." "I thought you’d like it. Was it worth the trip?" he asked. "Definitely," she sighed with a smile. The day passed quickly. "Bonnie, I think its time we headed to mainland Scotland. It looks like night-time will bring a storm." Bruce looked up at the clouds. "Let me have just another few sips and then we can be on our way," Bonnie said, drinking a little more nectar. "All right, I’m ready." Off they went, leaving the Hebrides behind them and heading towards a new adventure.